Guests love the wraparound, floor-to-ceiling windows in our Space Needle Corner rooms, which afford panoramic views of the iconic landmark and downtown Seattle. 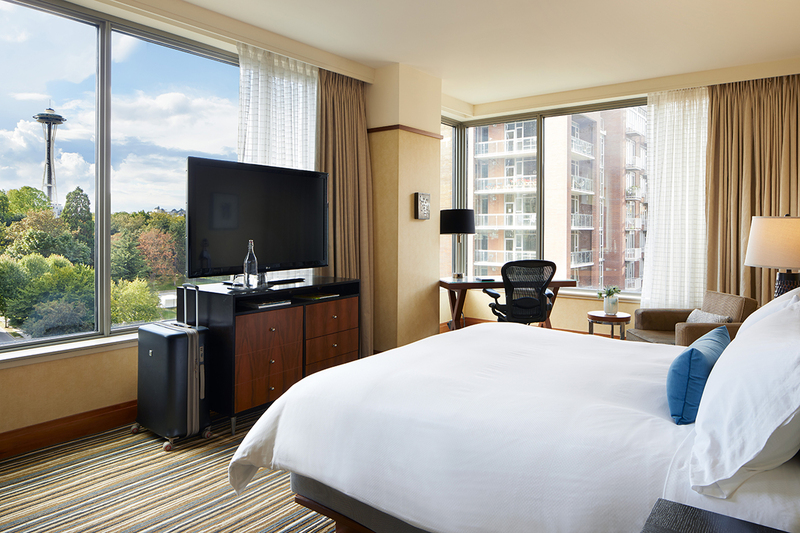 Flooded with natural light, these spacious 465-square-foot rooms are furnished with a king-sized Hypnos bed made with 360-thread count Egyptian linens and an executive-style workstation with a Herman Miller chair and complimentary Wi-Fis. En-suite bathrooms have a rainfall shower and a deep soaking tub, as well as a fully-stocked mini-bar, a Keurig coffee brewer, a 42” LCD television with on-demand movies and cable and plush cotton bathrobes and slippers.